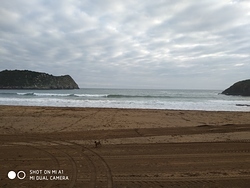 Playa de karraspio in Pais Vasco is a sheltered beach break that has inconsistent surf with no particular seasonal pattern. Offshore winds blow from the south with some shelter here from west winds. Tends to receive a mix of groundswells and windswells and the ideal swell direction is from the northwest. 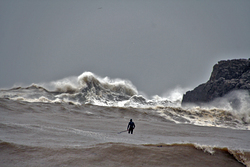 Waves at the beach are both lefts and rights. Best around high tide. Relatively few surfers here, even on good days. Beware of rips and rocks. For Lekeitio, 2 km from Playa de karraspio. At Bilbao/Sondika Airport, 36 km from Playa de karraspio. The two graphs above are also combined in the single Playa de karraspio surf consistency graph. Also see Playa de karraspio surf quality by season and Playa de karraspio surf quality by month. Compare Playa de karraspio with another surf break. The closest passenger airport to Playa de karraspio is Bilbao Airport (BIO) in Spain, 35 km (22 miles) away (directly). The second nearest airport to Playa de karraspio is San Sebastian Airport (EAS), also in Spain, 56 km (35 miles) away. Third is Vitoria Airport (VIT) in Spain, 56 km (35 miles) away. Anglet (Biarritz-bayonne) Airport (BIQ) in France is 79 km (49 miles) away. Pamplona Airport (PNA) in Spain is the fifth nearest airport to Playa de karraspio and is 94 km (58 miles) away. 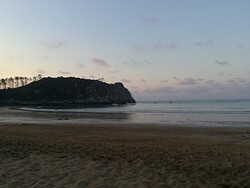 This is the Surf-Forecast page for Playa de karraspio, Pais Vasco. Use the tab navigation above to view Playa de karraspio sea temperature, Playa de karraspio photographs, Playa de karraspio detailed swell predictions, wind and weather forecasts, Playa de karraspio webcams, current wind from Pais Vasco live weather stations and Playa de karraspio tide predictions. 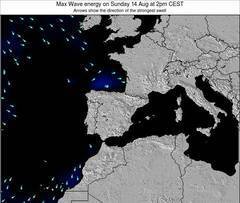 The Spain (Europe) swell maps link will open up the big picture showing Spain (Europe) and the surrounding seas. These swell maps can be animated to show the different swell components, wave energy, wave period, wave heights, together with wind and weather forecasts, current weather and sea state observations from Spain (Europe) wave-buoys, passing ships and coastal weather stations. Each of the forecast pages for this surf break feature a global and regional wavefinder tool to locate the best surf conditions in the area around Playa de karraspio.